…but just yesterday I decided to gather some of the last “green” garden plant leaves before the serious cold arrives to carry them off. Baptisia, heuchera (“Palace Purple”), culinary thyme, sage, vinca, and of course, that faithful green stalwart, the rose. And one new idea for a print: the roots of the borage plant. (More on that below). The green print is from baptisia and the purple from both heuchera and borage roots (the dotty parts). Last note: Memories of summer green. Some silk scarves eco-printed with red cabbage (blues), tagetes (oranges and greens), coreopsis (rust-reds), sumac berries (rosy reds and dark pinks), chartreuse greens ( Black Eyed Susans). I edged the scarves with open stitches: no turned hems (except one), just narrow zig-zag or straight stitching. 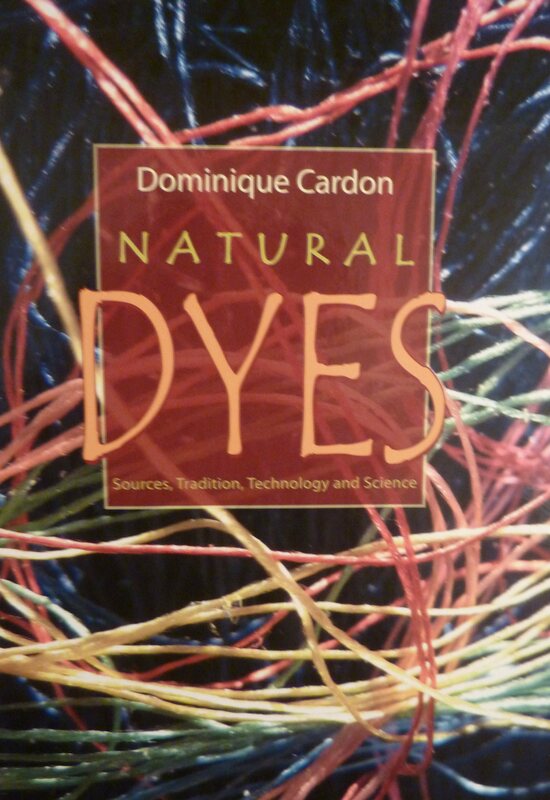 Dominique Cardon, author of “Natural Dyes: Sources, Tradition, Technology and Science” . 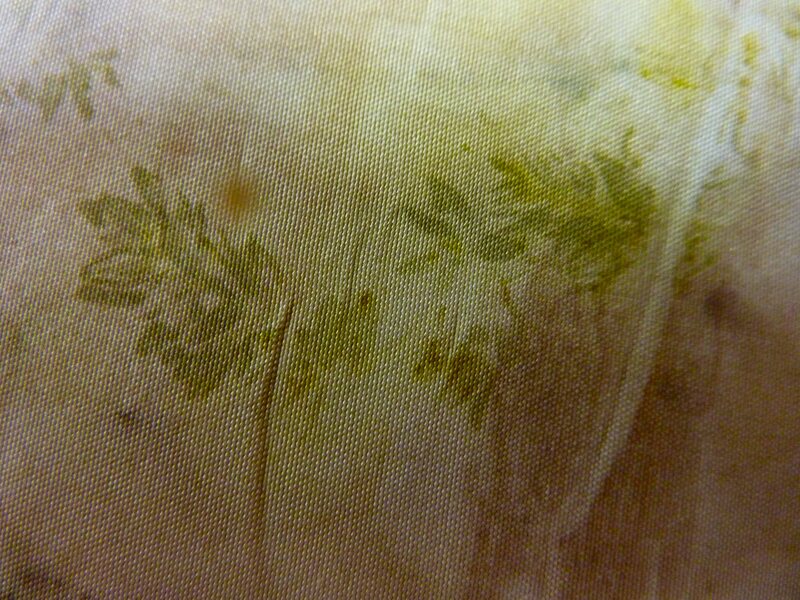 Next time: More adventures with eco printing eucalyptus. 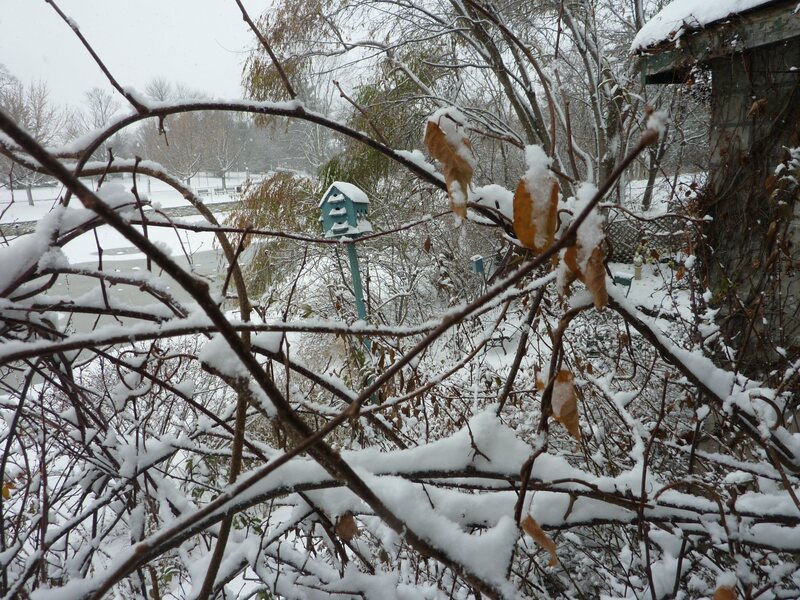 Love to see your garden snow. I’m a huge snow lover. I’ve had the Cardon: Natural Dyes book on my list to purchase, for a while now, but it is mighty expensive. Is it worth it’s weight in gold? as I imagine? A pic of calendula in snow for you. Re Dominique Cardon’s book: I love books as much as I do the fibre arts. 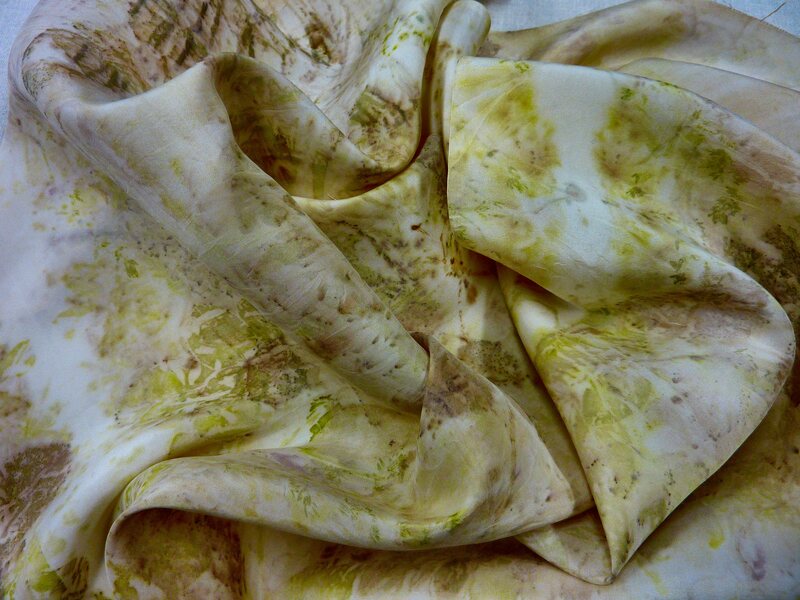 I have been keen to learn more than the “By Guess or By Golly” advice I have been finding about natural dyeing. I have collected several books now and taken others from the public library but I may as well buy the book I like for I often forget to take the books back and the fine is 25cents a day: Oops, if you have a dozen books. I have to say one can find contradictory info. As a mad gardener I appreciate Dr. Cardon;s book even more. 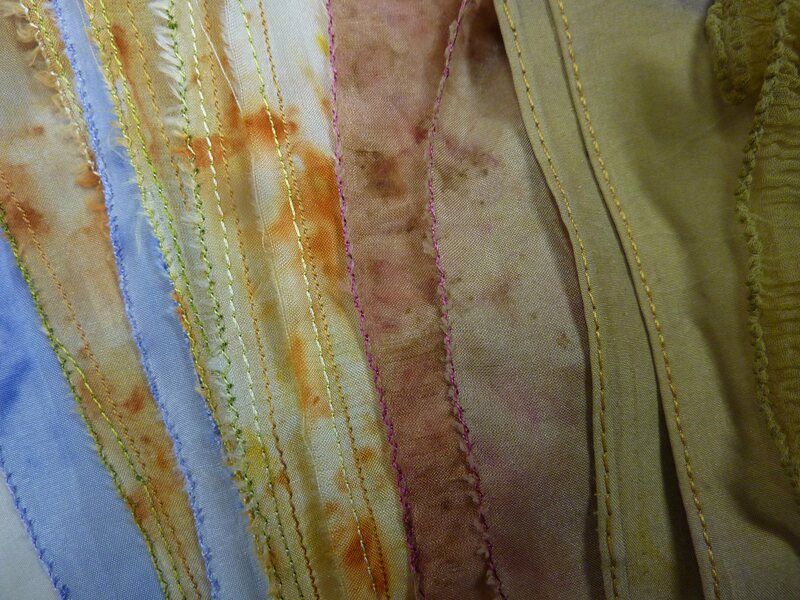 As far as I am concerned a book about a subject I am passionate about is worth its weight in…dye stuff at least. One of these days I will do s spreadsheet noting what the various dye writers recommend in their recipes. Sounds to me that this book is a good one. Thanks for helping me decide. I understand your keen interest in books, being a textile bookaholic myself … I’ve learned so much from researching what I want to know, by purchasing specific titles. 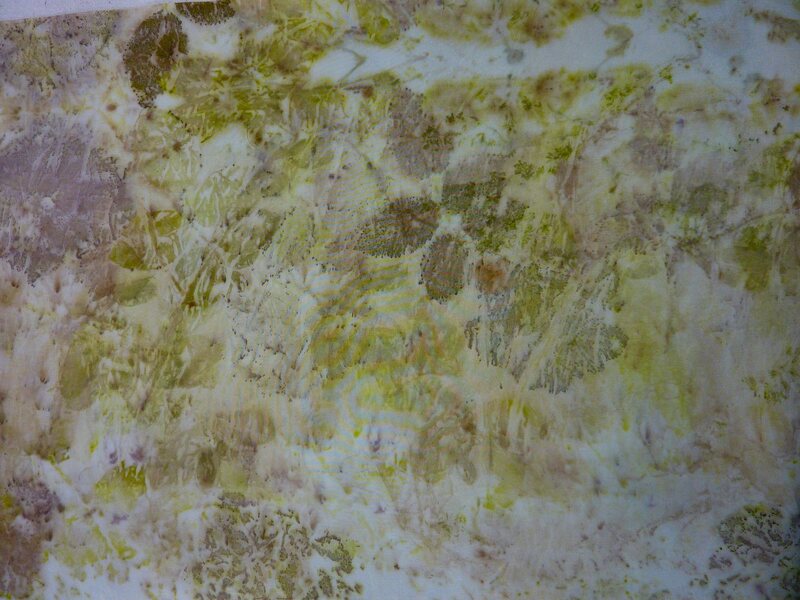 Next Next post: Eco printing again with eucalyptus: Golden Leaves!